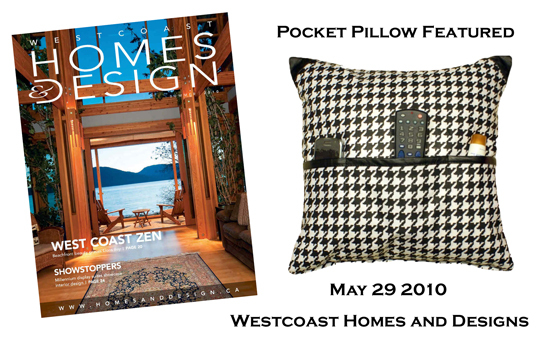 Pillowthrowdecor’s black and white houndstooth pocket pillow was featured as in hot products in Westcoast Homes and Design Magazine. This magazine is certainly THE SOURCE for Vancouver and the Lower Mainland for inspiring homes and fresh ideas. The magazine came out Friday, April 28th in The Vancouver Sun and is available on pickup racks through the summer. Of course I had my whole family, aunts and uncles, kids, kids’ friends and neighbors keep their copy for me. My family are my cheerleaders and stuff like this just thrills my Mom. I know she will be carrying it in her handbag to show the lady at the check-out counter and everyone else in her path that pauses too long. My mom’s an angel, as is my husband. Lucky me. Follow Laura Larson of West Coast Homes and Designs on Twitter, or on their site Househunting.ca / Vancouver Sun. Her tweets are always an interesting read!